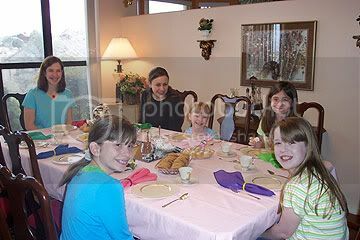 While visiting grandparents in Arizona we had a several lovely tea parties! My three little girls were made for this. They especially liked helping to set the table and preparing finger sandwiches. While on this visit we discovered the wonders of â€œvanillaâ€ and â€œIrish Creamâ€ flavored loose teas. We tried these at a tea shop and I am thinking now that I must find a source to purchase these â€“ they were heavenly. What are your favorite teas? Please share in the comments section of the blog. And remember, I’m still taking photos and teatime experiences to share on the blog. We’ll have a drawing in June for the one who will win a Brown Betty teapot. In the meantime, anyone who sends a photo and short description of her family’s teatime will receive a free back issue of the Arrow or Slingshot. We are all hooked on Chai tea around here. We like lots of milk and honey in it, cold or hot! Today is Tuesday. And, by golly, we WILL have tea time!! !